Lynne Curry, Ph.D., SPHR (CEO of The Growth Company, Inc. and author of Solutions and Beating the Workplace Bully) has over 30 years of experience in management consulting and frequently receives questions from clients regarding situations in the workplace. 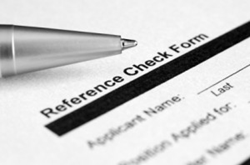 Today, Dr. Curry discusses a question about reference checks done after job offers. We made the offer prior to completing reference checks. Today Dr. Curry offers insight into how to deal with revealing information gained through reference checks. Lynne Curry, Ph.D., SPHR (CEO of The Growth Company, Inc.) has over 30 years of experience in management consulting and frequently receives questions from clients regarding situations in the workplace. "We recently advertised for a hard-to-fill position in our company. We made an offer to the top candidate prior to completing his reference checks. He accepted, and now we’re worried. Several of his references describe him as arrogant, abrasive and a superstar who believes his own press releases and doesn’t care who he ticks off. This stunned us as none of this behavior showed up in the interview. We’ve decided to take a risk; however, we want to know what we have to do so we don’t regret hiring him." The Growth Company, Inc. is a Human Resource and Management consulting firm specializing in soft skills training, facilitation and mediation as well as investigations, coaching and manual/policy write ups and re-writes. The Growth Company, Inc. was established in 1978 and is one of the longest lasting consulting firms in Alaska. For further information about The Growth Company or Dr. Lynne Curry click here or go to http://www.thegrowthcompany.com. The Growth Company also has a Workplace Coach Blog, where Dr. Lynne Curry and other HR professionals post about everyday situations that a manager or supervisor may come across. They provide insight and the correct way to approach and handle these situations.